Contact OneDesign regarding any of your product design and engineering needs. 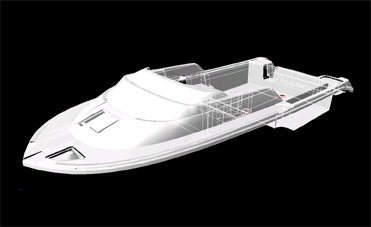 A ready for milling machine surface model of a hull includes all hydrostatics analysis and a rendering suitable for advanced website posting. Full and partial projects are welcome and may include hull, deck, console, liner, stringers, hatch lids, livewell, tubs, etc; all mill ready files can be completed in 14 - 16 weeks. CE Application paperwork for any Category B or C boat can be completed very quickly. I welcome the opportunity to quote your project. Florida Structural Professional Engineer, Dan Mielke.